What makes Marissa unique? Her high energy and positive spirit are what separates her from most people. That energy is always front and center for each and every endeavor she pursues. She demonstrates a tremendous range of skills, while always excited to take on new opportunities and challenges. Her strongest passions fall into the arts as showcased in her 20+ years of figure skating and 18+ years of dance experience. Her most crowning achievements in skating include competing at the National level with her synchronized skating team and securing a 4th place finish at the 2010 Adult Championships. In dance, Marissa landed a 3rd place finish with her studio in the 2003 “I Love Dance” National competition. She is proud to be a Syracuse Alum, where she earned a Bachelors of Science in Communication Sciences and Disorders and a Bachelor of Arts in Sociology. She was a Co-Captain of the Syracuse University Synchronized Skating Team and she was also part of the Syracuse DanceWorks company as a cast member performing in their annual Spring Production. In skating, she has her Senior Moves-in-the-Field, Senior Freestyle, and Silver Dance tests. In dance, she was trained in classical ballet, lyrical, modern, pointe, classical jazz, and hip hop. Beyond her years in skating and dancing competitively she has been a researcher for IceNetwork.com; team leader for the 2011, 2013 & 2014 U.S. Figure Skating National Program Components Camps; volunteer coordinator for Skate for Life in 2009; coach and Learn-to-Skate instructor at various rinks in her hometown and Syracuse University; a freelance music editor specializing in figure skating programs; and she was classically trained in piano at the Cleveland Institute of Music. The saying of "if you want to get something done, give it to a busy person" was designed for Marissa. She has found time to help volunteer with the Special Olympics program at Winterhurst and also helped fundraise more than $1, 000 for the Muscular Dystrophy Association with the 2009 Skate for Life show, helping her to earn a solo as a fundraising cast member. Marissa is a coach based out of Cleveland, Ohio and is a current member of the U.S. Figure Skating Basic Skills Committee. Executive Assistant to the COO at Rock The House Entertainment Group, Inc.: 2014 to present. Co-Director; Winterhurst Basic Skills Program: 2011 to 2013. Researcher; NBC Olympics 2014: Worked at the NBC Sports Group headquarters in Stamford, CT as a figure skating researcher for "Olympic Ice", an online figure skating show hosted by Sarah Hughes and Russ Thaler which covered figure skating topics and stories from the 2014 Winter Olympics. Researcher; IceNetwork.com 2010-2013: On-site researcher at 2013 U.S. International Classic in Salt Lake City, UT; 2011 Hilton HHonors Skate America in Ontario, CA; 2012 U.S. Figure Skating Championships in San Jose, CA; 2012 U.S. Synchronized Skating Championships in Worchester, MA; 2010 Skate America in Portland, OR; 2011 Junior National Championships in Salt Lake City, UT; 2011 U.S. Figure Skating Championships in Greensboro, NC; and 2011 U.S. Synchronized Skating Championships in Ontario, CA. Responsible for providing facts on, including but not limited to, competitor biographical information, event information, U.S. Figure Skating information, past competition results, etc. for use during live commentary through online video stream. She was also a Production Assistant for the 2009-2010 season. She assisted the production crew on-site for 2010 Junior National Championships in Strongsville, OH and 2010 U.S. Figure Skating Championships in Spokane, WA. Team Leader; 2011, 2013 & 2014 U.S. Figure Skating National Program Components Camp: Team Leader for the higher level skaters. 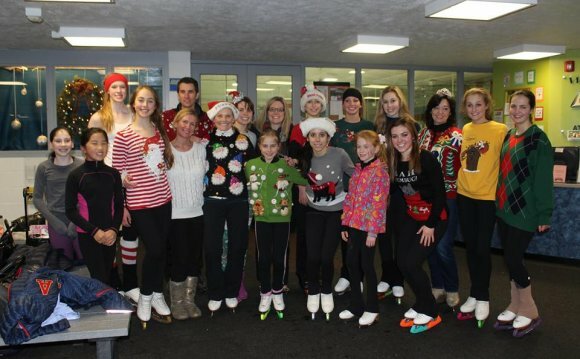 Attended all on-ice and off-ice classes with the skaters. Responsible for making sure skaters were ready and at each activity/class on time. Assisted with team building activities. Coach/Instructor; Tennity Ice Pavillion 2006-2009: Taught the Learn-to-Skate (tots through adults) and Community Recreation Program (youth ages 4-9 years) at the Syracuse University ice rink. Instructor for the Syracuse University and SUNY ESF "PED 200 Intermediate Figure Skating" 1-credit course for the fall 2007, 2008 and spring 2009 semesters. Taught private lessons upon request. Co-Captain; Orange Experience Synchronized Skating Team 2008-2009: Co-Captain of the Syracuse University Synchronized Skating Team. Acted as contact for USFS, scheduled and ran on and off-ice practices, planned team building events, assigned duties to board members, team activities included the fall and spring semester ice shows at Tennity Ice Pavilion; 2008 Dr. Porter Synchronized Skating Classic; 2008 & 2009 Eastern Synchronized Team Skating Championships; 2008 U.S. Synchronized Team Skating Championships. Coordinated and performed in the spring 2009 ice show. Was also a member of the team for the 2007-2008 season. Volunteer Coordinator; Skate For Life 2009: Responsible for organizing a team of volunteers with other coordinators to assist in the running of the “Skate For Life” benefit show for the Muscular Dystrophy Association. This included tasks such as set load-in and load-out, general set-up, monitoring the various events for the show, ticket sales, sponsorships, etc. Choreographer; Winterhurst Club Show 2009: Choreographed and performed in a group number to "Smooth Criminal" with club skaters incorporating a mini dance breakdown at the end of the number. Choreographed a solo for club skater; also choreographed and performed her own solo. Choreographed and performed in a group number to a 90s medley with the Winterhurst "Alumni". Learn-to-Skate Co-Coordinator; Winterhurst Club Show 2011: Along with her LTS co-director, responsible for organizing Learn-to-Skate level group numbers for the club show. Responsibilities included choosing and editing music; assigning instructors to choreograph and coordinate each group; select costumes for each group; schedule all practices; assist skaters during the show. Additionally performed in a group number to a medley with the Winterhurst "Alumni".